Hello everyone, and welcome to the week! It’s time once again for our look back at the noteworthy updates of the last seven days. While I wasn’t keeping quite as careful an eye as usual due to a brief vacation I took, I still found a few nifty updates that some of you might care about. Well, I tried, at least. Of course, you can keep an eye out for updates yourself using AppShopper or by participating in the TouchArcade forums. This weekly summary is just here to fill you in on the things you might have missed. Let’s dig in! Fighting Fantasy Classics, Free I absolutely love Tin Man’s Fighting Fantasy Classics app, and it’s nice to see the updates are already rolling in. This one fixes a few nasty bugs but also adds in support for landscape mode per player requests. There’s also a new rewind feature for those playing in Free Read mode, allowing you to go back whenever you like. The next update will apparently implement a mapping feature, and we should be seeing some new books roll in sooner or later as well. TetrisÂ® Blitz, Free I’ve already given my opinion on Tetris Blitz a few times in these columns, but if you somehow missed it, I would summarize it by saying that trying to add to Tetris only subtracts from it. Subtracting from it this time around are some new power-up upgrades. Six, to be precise. You can also upgrade power-ups to level 4, allowing you boost your scores without becoming any better at the game at all! Perfect. Anyway, it’s not like a somewhat normal version of Tetris isn’t available on iOS, so I suppose they can do what they like with this one. PAKO 2, $1.99 Games like Pako 2 live or die based on how long their content can keep players satisfied, so updates that add new stuff to do or new things to play around with are the best kind of all. And that’s what this update is! You get a new map to practice your getaway driving skills in called Sunny Coast, and three new cars to do that in. The Leguan, Wolf, and Fox are the new getaway vehicles, and I’ll leave it to you to figure out what they’re all about. 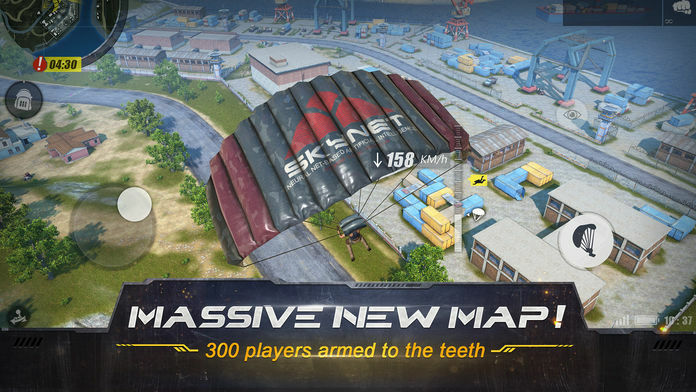 Rules of Survival, Free With the more famous games that inspired it alive and well on the App Store, Rules of Survival is going to have to fight hard if it’s going to keep up its early momentum. Regular updates are a good way of doing that, and you have to at least hand that much to NetEase: they’ve been all over bringing new things to this game. This new update includes a Water-Sprinkling Festival mission, some water-themed paint jobs for your weapons, a new M32 grenade gun, the new Damascus Knife weapon, and more. The Elder Scrolls: Legends CCG, Free Speaking strictly as an outsider to the whole business, Bethesda sometimes seems a little stuck on Skyrim. Like, they can’t seem to move past it. But then, boom, look here: a Morrowind-themed update of all things for Elder Scrolls: Legends. Houses of Morrowind is the name of this particular expansion and it adds more than 140 new cards to the game in effort to bring that Morrowind flavor. This update also introduces Three-Attribute decks, and the world may never be the same. The, er, world of Elder Scrolls: Legends, that is. I’m pretty sure the rest of the world will get on fine killing time between new versions of Skyrim. I guess I’ll give this the coveted UMMSotW award this week since nothing else is jumping out at me. Fortnite, Free It feels a little late for Easter updates. I mean, this one hit a few days ago so it’s not that late, but it did miss the holiday anyway. But you know what? Fortnite is pretty much the hottest thing around in mobile at the moment, and I like to keep my job, so if it updates with anything even remotely interesting, it’s getting included in here for the foreseeable future. So bring on the Egg Launcher, my friends. This is a cosmetic change to the grenade launcher that will bring delightful thoughts of the season, I’m sure. This update also includes a new weapon in the form of the guided missile. It’s a missile. You can guide it. Throw in a couple of new features, a limited-time new mode, and some bug fixes, and there you go. And here I go. Candy Crush Saga, Free I love how Candy Crush updates don’t even mention the new levels anymore beyond the most generic sense. They don’t say the total number, they don’t say how many new levels there are, and they certainly don’t discuss any new mechanics that may appear in said levels. Well, this app updated and that probably means there are some new levels. Odds are good the number is 20, and odds are even better that they don’t really have anything new to them. But if you’re far enough along to actually see them, you’re going to play them anyway. Such is the curse of the Candy. Sonic Forces, Free It’s weird how SEGA seems to have attached some of its more notable Sonic game-related failures to their behind-the-back mobile runners. The original Sonic Dash had that cross-over with Sonic: Lost World, the follow-up was a spin-off of Sonic Boom (great TV show, mind you), and the third game is based on Sonic Forces, the only Sonic Team-developed Sonic game to lose out to what is essentially an ascended fan-game in the same year it released. Ah well. This update adds some new missions, two new tracks, some new music for the Mystic Jungle Zone tracks, and the usual performance improvements and bug fixes.